Caritas young leaders from across Latin America and the Caribbean, England and Canada gather in Panama to participate on the 34th World Youth Day. They are actively involved in the mission of Caritas on volunteer coordination, peace and reconciliation, campaigning and emergency response. Together they share a common desire to promote faith in action. Young people from Cáritas Panamá welcome the group and accompany them through some of their most engaging projects. The group visits Fundacion Casa Hogar Buen Samaritano, a care home for people affected by HIV. “The relationhip we have built up with those we support has become an enriching addition to the lives of all involved, including our young volunteers”, says Fr Patrick Hanssens, Director of Pastoral Social-Cáritas Panamá. 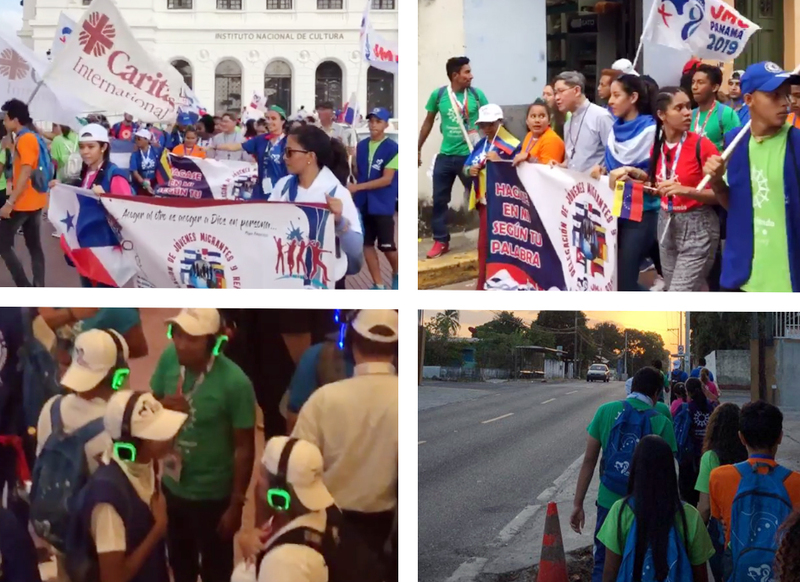 Caritas Youth in Panama are embracing diversity and the ‘culture of encounter’. The group met Analee, a 20-year old Panamanian woman who arrived at the centre two years ago pregnant with HIV. At that time, she explains, the law obliged pregnant women with HIV to terminate their pregnancy. Her doctor told her that she would lose her baby if she did not start a treatment immediately. Because of her strong faith and determination, Analee could afford her treatment with the help of the centre. Today she is a mother of a two-year old girl. Caritas young leaders also visited Pastoral de Movilidad Humana, a refugee centre that assist migrants and refugees in search of more dignified life. Jorge Ayala, responsible for the running of the centre, explains some key facts and figures about migration in Panama. He encourages people to have a proactive conversation with migrants “at a human level, where we all belong, so we understand each other better.” Caritas young leaders and migrants from the centre share their stories and exchange posters and photos from Share the Journey campaign. The group still has a week long program ahead of them. But the need for more spaces for reflections and inspiration is prominent. How can Caritas young leaders make a positive and lasting difference in the world?